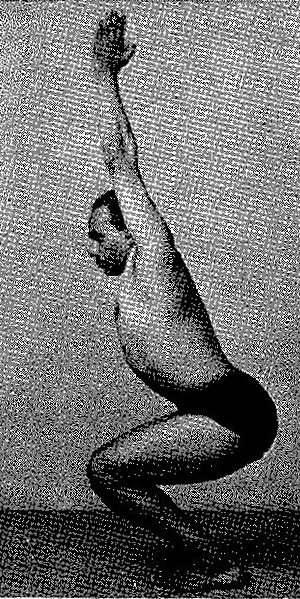 Stand in Tadasana. Stretch your arms straight overhead and join your palms. On an exhale, bend your knees until your thighs are parallel to the floor. Rather than folding forward, keep your chest back and your spine straight and tall. Remain in this pose, balance, and breathe for up to 30 seconds. Iyengar's knees are way in front of his ankles! This alters his center of gravity and allows him to move deeper into this pose than I can. My primary limitation is at the ankles, which simply don't want to dorsiflex that much. To assist me in balancing, I'm drawing up on my toes and the transverse arches of my feet. Iyengar's feet are much more relaxed and soft.